This website is owned by KellMed Ltd. KellMed Ltd owns the copyright in all of the information and documentation contained on this website and therefore these terms and conditions have been set by KellMed Ltd. Your use of this website is subject to the terms and conditions that follow. Please read them carefully. By proceeding to browse and use this website you are deemed to have agreed to comply with and be bound by these terms and conditions, which together with our Privacy and Cookies Statement set out below govern KellMed Ltd relationship with you with regards to your use of this website. If you do not agree with any of these terms and conditions please leave this website immediately. Please note that this website is intended for KellMed Ltd members in the United Kingdom only. This site is not applicable to KellMed Ltd members who are residents of other countries as the law in other countries may restrict the distribution of the information available on this website. KellMed Ltd reserves the right to amend these terms and conditions at any time and from time to time. If these terms and conditions change in any way, we will post an updated version on this page. Amendments to these terms and conditions will apply to your use of this website and by continuing to use the website after such changes you are deemed to have agreed with these amendments. KellMed Ltd also reserves the right to remove or cease to supply any information or service contained on this website. In the event that removal takes place we shall not be liable to you in any way whatsoever for this removal. KellMed Ltd tries to ensure that this website access is uninterrupted and error free. However, due to the nature of the internet the website is provided on an “as available” basis. KellMed Ltd will not be liable if for any reason the website is unavailable at any time for any period. KellMed Ltd will not be liable for loss or damage arising if this website becomes unavailable or is suspended for any reason. Unless otherwise stated, the rights in the information, documentation, designs, pictures, logos, photographs and other content of this website are owned by or licensed to KellMed Ltd. They are protected by copyright, trademarks and other intellectual property rights. You must not use any material on this website in any way that infringes the intellectual property rights in it. You may view, download and print individual pages or documents from this website which you may then use, copy or reproduce for your own internal non-profit making purposes, provided you keep intact any copyright and other proprietary notices. However, under no circumstances are you permitted to download, copy, reproduce, modify, redistribute, republish, display, post, transmit or extract any part of this website with a view to profit or gain. In addition, you must not sell or distribute any of the material on this website to third parties who are not members of the KellMed Ltd, whether for monetary payment or otherwise. Any personal information supplied by you to KellMed Ltd will be processed in accordance with the provisions of the Data Protection Act 1998 (as amended). If you supply personal data via this website, you will be told how this data will be used at that point. Through your use of this website, you agree that personal information that is provided will be dealt with according to our Privacy and Cookies Statement. If you have any questions regarding the Data Protection Act 1998 or KellMed Ltd Privacy and Cookies Statement, please contact KellMed Ltd.
Subject to the terms of our Privacy and Cookies Statement, KellMed Ltd will monitor use of this website and this information will be used by KellMed Ltd for internal business purposes or in accordance with the rules of any applicable regulatory or self-regulatory organisation. The publication of the information and documentation provided on this website by KellMed Ltd does not constitute a recommendation that you enter into a particular transaction, nor a representation that any service detailed on this website is suitable or appropriate for you. 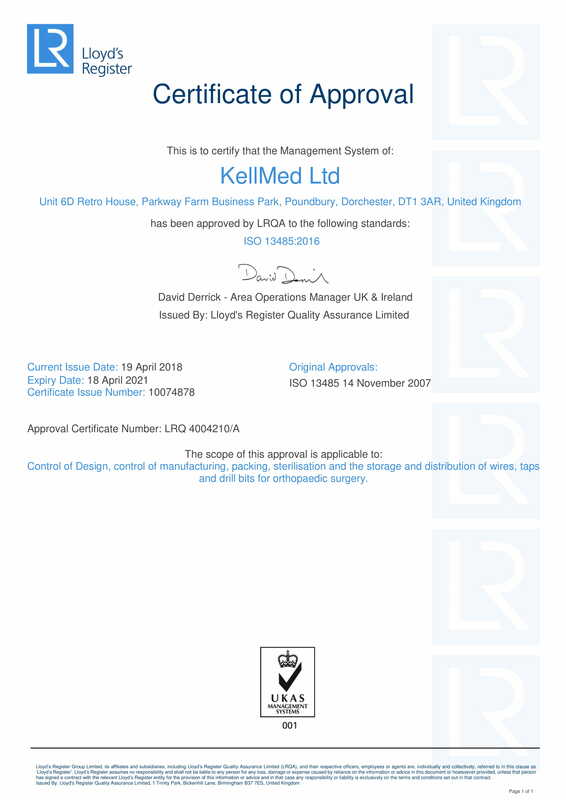 Links from our website to third party websites are provided purely for your convenience and such links do not constitute an endorsement, affiliation or authorisation by KellMed Ltd with respect to such third party websites. When you activate these links you will leave our website. We do not endorse or take responsibility for the content on third party websites or the availability of these websites and we are not liable for any loss or damage that you may suffer by using these websites. If you decide to access linked websites you do so entirely at your own risk. KellMed Ltd cannot warrant that this website is free of viruses or technical defects of any description and will not be responsible for any technical problems arising from the use of this website. KellMed Ltd will take all reasonable steps to ensure that any personal information you provide to us is kept secure. However, because of the nature of the internet, we cannot and do not guarantee that personal information you provide will not be intercepted by others and decrypted. Consequently, your privacy cannot be guaranteed. Please refer to our Privacy and Cookies Statement below.